The round buttonhole, also called an eyelet buttonhole, doesn’t look like a sewn buttonhole — it’s round, not slit-like. But knitting a round buttonhole is easy to remember, simple to execute, and adjusts to fit whatever button is appropriate for the yarn and needle size you’re using. Always pair a decrease with the yarn over when you work an eyelet buttonhole. Knit Row 1 (RS) to 2 stitches before the buttonhole stitch. Make a double yarn over by bringing the yarn through the needles to the front, then over the RH needle to the back, then to the front between the needles again. To work Row 2, purl to the yarn over. Purl into the yarn over, letting the second wrap drop from the left needle. Purl to the end of the row. Knit Row 3 to the stitch above the buttonhole. 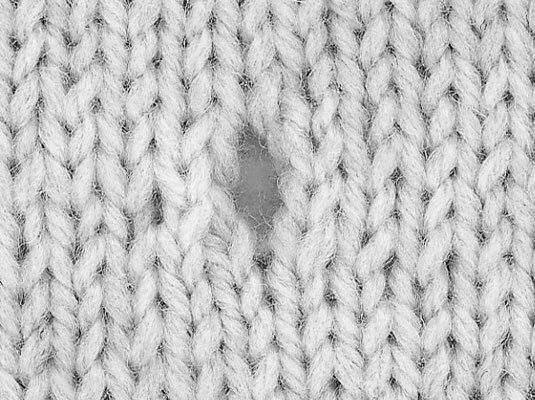 Knit into the hole (not the stitch above) and carry on. You can work a round (or eyelet) buttonhole in stockinette fabric, but it also sits discreetly in the purl troughs of ribbing and is all but invisible in garter stitch.